becks TAVERN offers German inspired cuisine joined with delicious American favorites such as wings and burgers and a full bar. Open for lunch & dinner. See hours & menu. The Lodge is your alpine vacation escape two minutes from both the lifts at Gore Mountain and the Hudson River. We offer the convenience of a good night’s sleep beneath majestic pines, yet we are only minutes away from a handful of great dining and recreation options. With trails right out the back door, there’s nothing better than exploring the woods first thing in the morning with a cup of coffee. Whether you are here for a ski trip, planning a Spring White Water Rafting Adventure, or just want to get away from the city for a few nights rest, we’d love to host you and share the experience of our family run retreat tucked away in the mountains. Our decorated rooms are equipped with two queen beds and/or a king bed with bunks. You’ll find the quarters spacious and accommodating up to four persons, making us the most comfortable lodging option around. Gore Mountain Lodge has been tastefully renovated and refurnished. In fact, we’re still working on it, making it better all the time. From refrigerators to flashlights to solar panels as well as framed artworks created by the owners (and their children), we’ve thought of everything to enhance your mountain stay. Curl up and relax in front of a 40″ Sony flat screen, enjoy free Wi-Fi (with plenty of bandwidth for personal and business needs) as well as complimentary Verizon service throughout our property. Unplug, unwind, and explore our majestic forest. It’s all here for you. Book Your Stay at the Gore Mountain Lodge Today! Visit Expedia to arrange your vacation booking. But please feel free to phone 855-8-GORE-ML (855-846-7365) or email us if you can’t find exactly what you’re looking for online. Expedia can be tricky and we often have availability even when our rooms don’t show up online. As a family run lodge, we remain flexible to your needs and can suggest any number of options if you contact us directly. 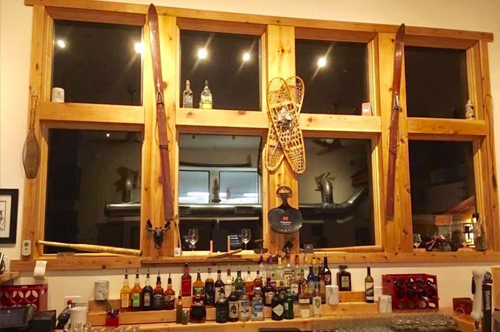 becks TAVERN is North Creek’s newest restaurant and bar located right next to the Gore Mountain Lodge. Serving a German inspired and American favorites menu and a full bar. North Creek is home to the first downhill ski center in New York and the original Snow Train which transported winter-sports enthusiasts to the High Peaks in the 1930s. The area’s rich and diverse options to travelers exploring upstate New York and the Adirondack Park are unparalleled. Today the ski center is known as Gore Mountain. If conquering the Adirondack High Peaks or navigating the Hudson’s white water rapids aren’t your idea of the perfect day, stroll the historic streets of North Creek to experience a unique Adirondack town only a mile away from our lodge. Ask us, and we’d be happy to recommend a day’s itinerary beyond skiing. VisitNorthCreek.org And please visit the Gore Chamber of Commerce to discover the many activities in the area as well as to explore your dining options. 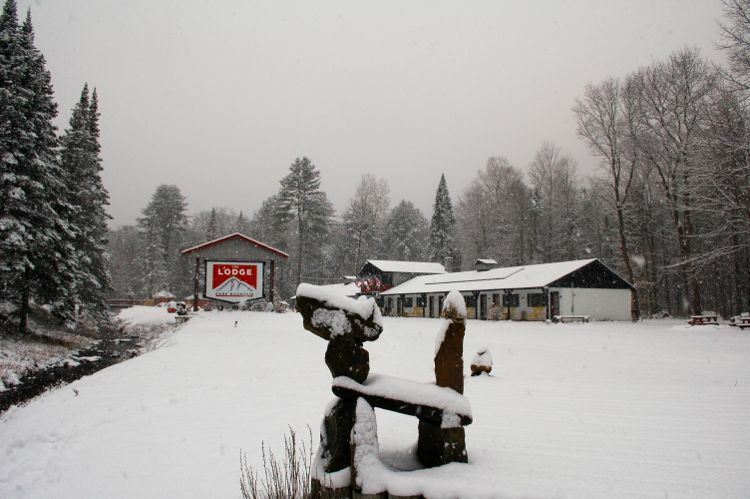 We believe we are the most unique and relaxing lodging option not only in North Creek but also in all the Adirondacks. Say hello and take home a complimentary sticker and grab a cup of coffee. • Get your new favorite Monday morning mug here! • And hats for sale!